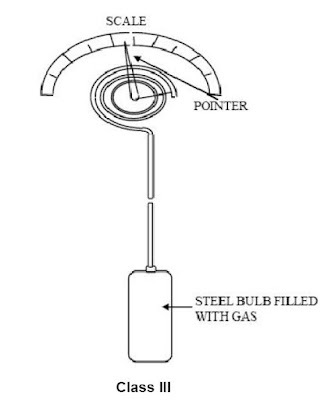 Filled-bulb systems use the principle of fluid expansion to measure temperature. If a fluid is enclosed in a sealed system and then heated, the molecules in that fluid will exert a greater pressure on the walls of the enclosing vessel. 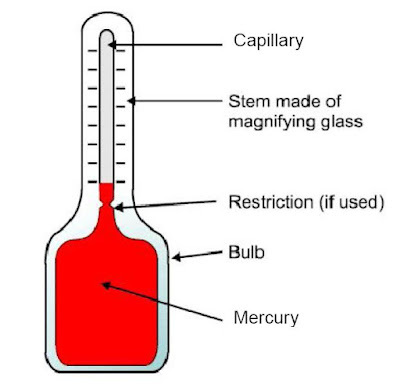 By measuring this pressure, and/or by allowing the fluid to expand under constant pressure, we may infer the temperature of the fluid. 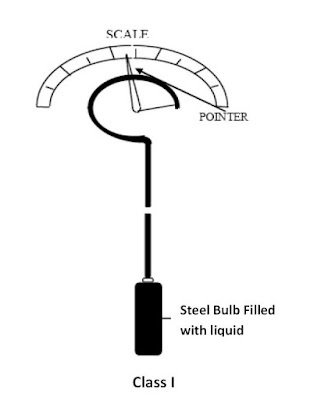 The steel bulb, stem and indicator (Bourdon tube) are completely filled under pressure with a liquid. The system is totally filled to provide a constant volume. 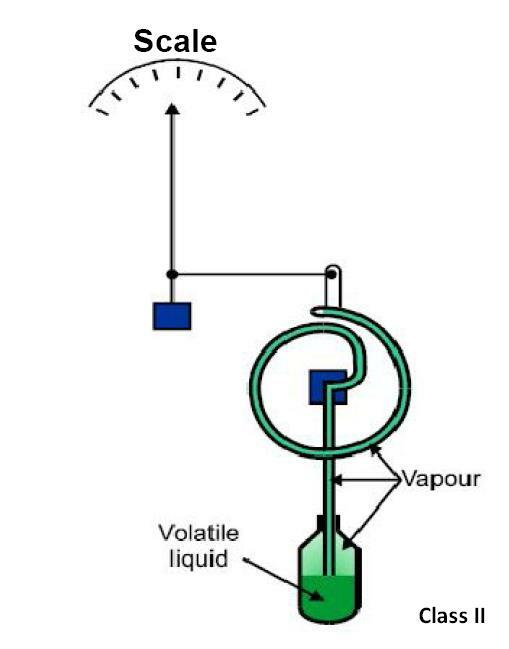 Expansion of the fluid in the tube is converted to a pressure. This pressure expands the Bourdon tube which moves the pointer on the scale. Liquid expansion systems have narrow spans, small sensors and give high accuracy. They also have the ability to provide temperature compensation using either an auxiliary capillary or bimetallic techniques. Fully compensated liquid expansion systems are expensive and complex. 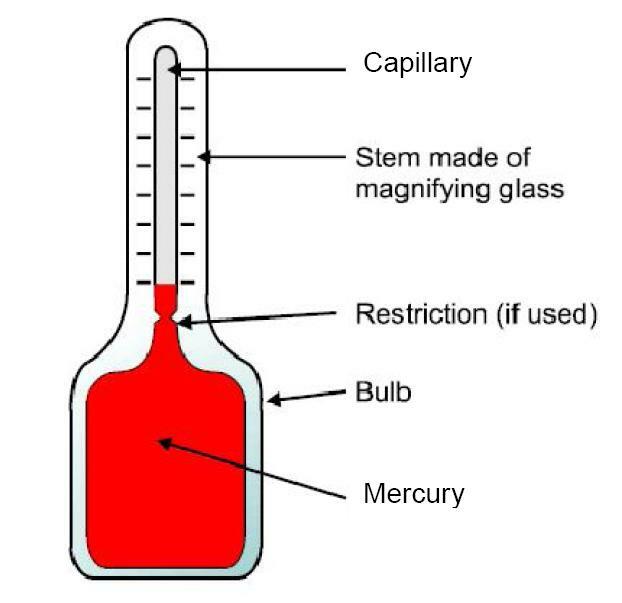 Liquid filled systems have the advantage over Mercury in that the expansion of the fluid is about six times that of a Mercury system. These also have the added advantage of using smaller bulbs. The normal operating minimum for this type of sensing is from -75 oC to -210 oC, with the maximum being up to 315 oC. Over range protection is of particular concern in liquid filled systems, and is typically 100% over the normal operating range. Vapour pressure systems are quite accurate and reliable. They also do not require any compensation for temperature effects. This form of measurement is based on the vapour-pressure curves of the fluid and measurement occurs at the transition between the liquid and vapour phases. 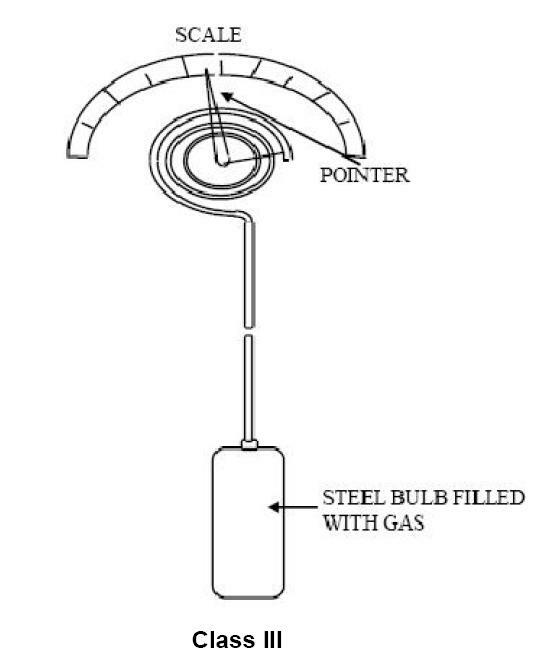 This transition occurs in the bulb, and will move slightly with temperature, but it is the pressure that is affected and causes the measurement. If the temperature is raised, more liquid will vaporise and the pressure will increase. A decrease in temperature will result in condensation of some of the vapour, and the pressure will decrease. Different materials have different vapour pressure-temperature characteristics. Methyl chloride is quite commonly used in this type of sensor. Ethane is used for low temperature operation, typically from about -70 oC to 30 oC. Whereas for high temperature applications, Ethyl Chloride can be used, with an effective operating range from 40 oC to 175 oC. Vapour filled thermal systems are non-linear, and are generally more sensitive at the higher end of the scale. Selecting and sizing the application so that the range of operation is at the higher end can prove advantageous and provide better measurements. Over range protection may become a problem as vapour filled systems have a low over range limit. Here, the change in pressure with temperature (as described by the Ideal Gas Law: PV = nRT) allows us to sense the bulb’s temperature. As the volume is kept constant, the pressure varies in direct proportion to the absolute temperature. Nitrogen is quite commonly used with gas filled systems. It doesn’t react easily and is inexpensive, although it does have temperature limitations. At low temperatures and above 400 oC, helium should be considered. The range of operation is determined by the initial filling pressure. Gas filled systems do provide a faster response than other filled devices, and as it converts temperature directly into pressure it is particularly useful in pneumatic systems. This type of measurement also has the advantage that there are no moving parts and no electrical stimulation. The size of the bulb is not critical and in fact can be sized quite large for averaging measurements in large volumes such as dryers and ovens. Mercury filled systems provides the widest range of operation, which ranges from the freezing to boiling point of the metal, ie from -40 oC to 650 oC. Systems using this technology are simple, inexpensive and have fast responses. Typically they also have good over range protection.